CELEBRATE ST. PADDLE'S DAY ! Time: Matches begin at 8:00 A.M. Tourney Sponsors: Athleta, Kraken Rum. The Tennis Spot, Wilson.Wilton Physical Therapy. Y Paddle membership “Early Registration” for Wilton Open 2020 begins 1/1/2020…General Registration opens 1/15/20. *Due to the fact that we have to pre-order favors, exchanging sizes will happen on a first-come first-serve basis and will depend on product availability. If sized favors, will be separate men's and women's sizes. If you missed out on one of the 2018 Kraken Hats, we are taking orders for anyone who wants to add to their collection. These fully lined beanies keep the chill at bay and are perfect for everyday paddle wear. Designed to commemorate our 35th annual Wilton Open. Net proceeds will go to Y Children's Charities. The story of the Wilton Open's beloved mascot -- the Kraken -- finds its origins at our 2010 annual event. A powerful nor'easter with 70 mph winds & producing 10+ inches of rain descended on the Wilton Y and partner clubs that memorable Saturday. Incredibly, of the sold out 32-team field, only one tandem cancelled their participation, all others persevering in nearly unplayable conditions and demonstrating fearless commitment to the sport and tournament. The intrepid spectators and finalists braving the elements recall during the championship match (Albrikes & Fried prevailed), witnessing an enormous, eight-limbed, menacing creature emerge from the adjacent Y pond. 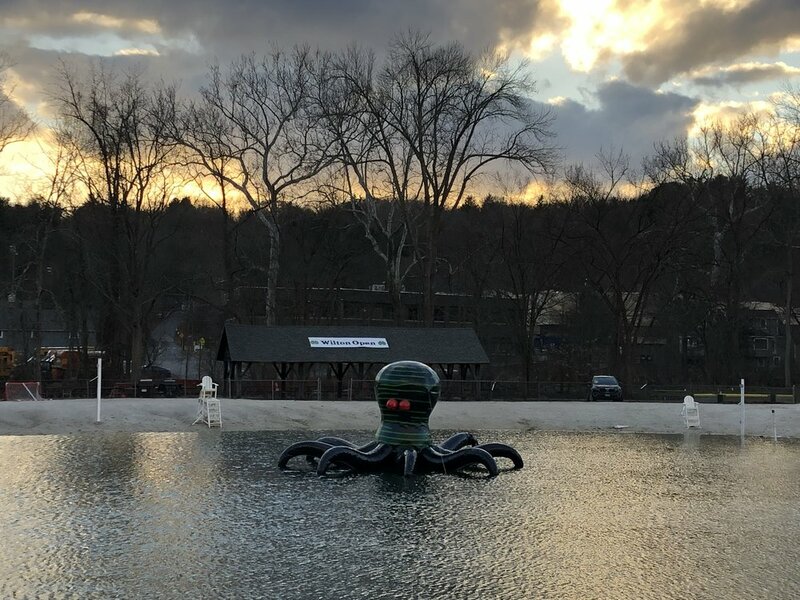 The playful Kraken appeared to be paying its respects to the participants' valiant spirit -- an esprit de corps the Wilton Open has fostered for 36 years and celebrates to this day. The Wilton Open Committee honors the Kraken in a myriad of ways including the 35th anniversary hat and in 2019 released a look-alike cephalopod to celebrate its first tournament appearance. Thanks to our loyal sponsors for making the Wilton Open the longest-running annual charity paddle tournament in the country -- and to our knowledge, the largest one-day, co-ed paddle event on the planet. Now in our 36th year, the Wilton Open celebrates the game, sportsmanship, the broader paddle community and St. Patrick's Day. Net proceeds are earmarked for the Y Children's Charities. Wilton Open returning sponsors include Wilson, Proximo Spirits/Kraken Rum and Wilton Physical Therapy. We welcome The Tennis Spot and Athleta to the family in 2019. The Riverbrook Y is an APTA member club.